Beautifully engraved certificate from the Chinadotcom Corporation. This historic document was printed by the Northern Banknote Company and has an ornate border around it with a vignette of the company logo. 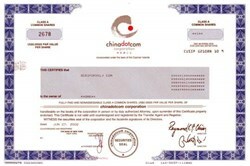 This item has the printed signatures of the Company’s Directors. China.com Corporation is a leading integrated enterprise solutions and software company offering technology, marketing, mobile and media services for companies throughout Greater China and the Asia-Pacific region, the US and the UK. 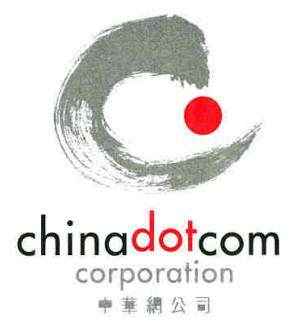 With operations in 10 markets, with over 1,000 employees - the companies under the chinadotcom group have extensive experience in several industry groups including finance, travel and manufacturing, and in key business areas, including e-business strategy, packaged software implementation and development, precision marketing and supply chain management. chinadotcom leverages this expertise with alliances and partnerships to help drive innovative client solutions.